Founded by Apostle Edgar Hill Roscoe, who’s ministry stretches over nearly 50 years, the El Tabernacle church in Walkerville, South Africa, has long suffered from acoustic issues which made it difficult for the worship leaders to be heard above the enthusiastic congregation. 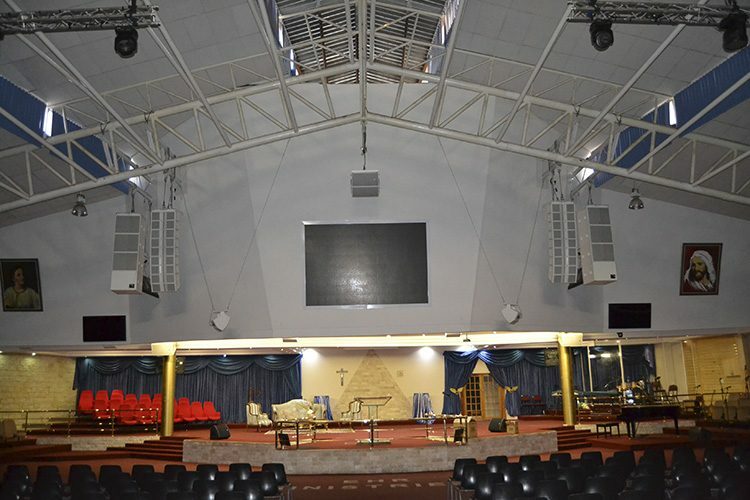 Situated in Gauteng, El Tabernacle is around half an hour from the centre of Johannesburg. Faced with considerable acoustic challenges, church elder Gustav Adams approached Richard Smith of local technical production specialists Sound Harmonics for advice on solving them. 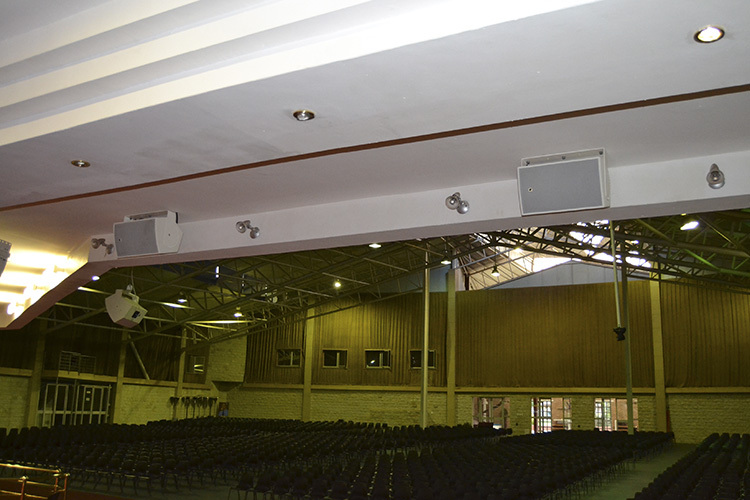 Richard proposed L-Acoustics KARAi and SB18i for the compact footprint and lightweight, coupled with enough SPL to cover the entire space, and most importantly, be heard over the congregation. Richard’s design features a main system of nine KARAi and four SB18i per side, with the subs being flown in cardioid configuration. Fills comprise a centre cluster of two ARCS Wide in a horizontal configuration, plus another ARCS Wide per side as front fills, augmented by a 12XTi outfill per side. A comprehensive monitoring setup includes four 12XTi and two 8XTi for the pastor, further pairs of 12XTi for the choir and side fills, with two more 8XTi for the church elders. The entire system is powered by LA4, LA4x and LA8 amplified controllers. Modelling everything in L-Acoustics Soundvision 3D acoustical simulation software was crucial to the project. “It is such a reliable and accurate tool that I am always confident in showing a client the result I am after, because I know that’s exactly what I will achieve. This project was a great example of that, the Soundvision plot precisely matching the coverage and SPLs that we achieved,” assured Richard. 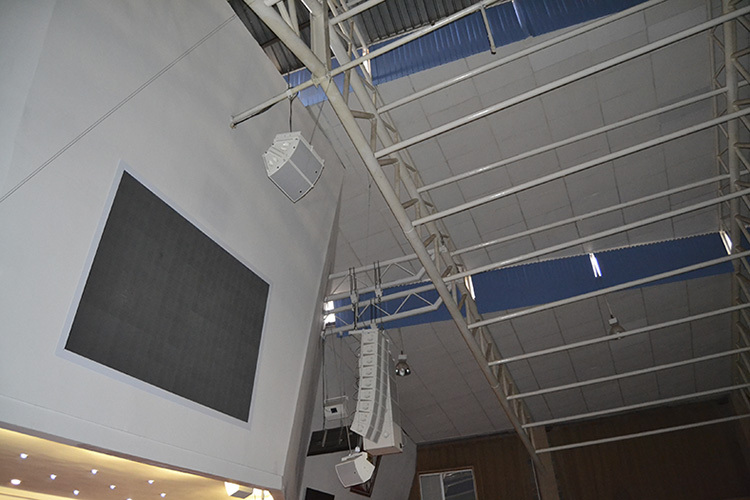 Apostle Roscoe and the church elders have pronounced themselves very happy with the system, with its size and the aesthetics coming in for as much praise as the seamless coverage and sound quality. “The system looks good and the client is ecstatic that we could supply it in white. In many ways the church is quite conservative and the ability to blend the speakers into the background was very important,” said Richard. Since the El Tabernacle tech team is run by volunteers, Sound Harmonics also spent time making sure the system was calibrated to the sound they wanted, and then training the staff to maintain it, week after week.